Crusaders defender Billy Joe Burns admits the champions are “marked men” this season. The Crues claimed back-to-back titles last term as they dominated the Danske Bank Premiership landscape. Stephen Baxter’s side are targeting treble heaven in 2015/16, but Burns believes their quest will be laced with danger once again. “It is going to be even tougher this season. Every time you win it the pressure mounts the following season,” the 27-year-old said. “You are a marked team and there is added pressure. Every team raises their game against you, but we are used to that. The champions have started the season in positive fashion, with two opening wins and last week’s draw with title rivals Linfield. Next up is Saturday’s trip to Coleraine. “We are pleased with the start to the season. 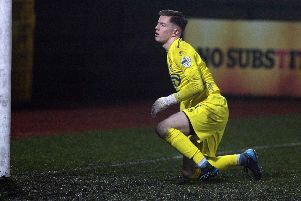 We had two great wins and then a decent point against Linfield,” he added. “Coleraine will be looking to bounce back following last week’s defeat. They will want to put that right, and they are a good team. “Any team can beat anyone on their day, and playing away to Coleraine is going to be another tough test for us. “It is a tough place to go for anyone, so we will need to be on top of our game if we want to come away with the win.